3 bathroom updates: His, Hers and Guests "AFTER"
The homeowners of a 1929, 2 story house requested my design assistance to update the 3 bathrooms in their house. They wanted to create a design that was reminiscent of the period when the house was built without moving any walls. The husband’s bathroom had the original small, tiled shower, a small pedestal sink and a toilet. He wanted the room to feel larger than the 8 foot by 5 foot existing area. We achieved this by removing the outside corner walls of the shower, and replaced them with a frameless glass enclosure. The new tile design created in navy is an art deco pattern in a field of white subway tiles. To compliment this, the floor tile is a white porcelain hexagon, with a navy liner and a border of white squares. The shower floor and niches are a 1” white hexagon. 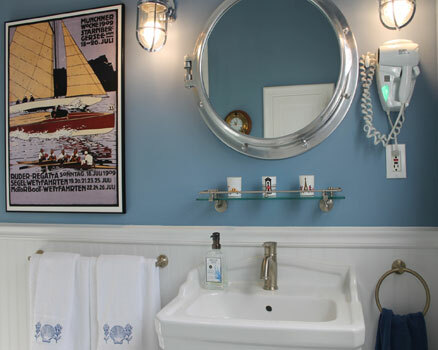 French blue walls above the new white bead board wainscot provide a backdrop for the nautical themed medicine cabinet, wall sconces and accessories. In the wife’s bathroom, we kept the tub and added a shower system and splash panel. The wall tile is Jeffrey Court white subway accented with a green egg & dart tile framing a center tile design of flowers for a calming focal point. A furniture-look vanity was selected and topped with Carrera marble. Feiss Murray LED wall scones frame the beveled mirror medicine cabinet providing good lighting and a touch of glamour. The floor tile is porcelain hexagon with a border of grey liners and white square tiles. These borders and hexagon tiles were very popular in the 1920’s and 30’s. The first floor guest bathroom also needed a fresh look. We removed the solid walls around the shower and replaced it with a frameless glass enclosure. The new shower walls are white subway from floor to ceiling. The floor and niche tile are white 1” hexagon tiles. Porcelain grey tiles are laid on a diagonal on the floor, framed with a square tile border that continues under the vanity. The classic white continues along the wall with a contemporary vanity with a glass top, integral sink and glass backsplash. The white framed mirror is flanked with LED wall sconces. The fresh design opens up the room and is welcoming to family and friends. Each bathroom has a new look that reflects the personality of each of the homeowners. The small rooms feel larger and have a timeless design that they can enjoy for many years to come.